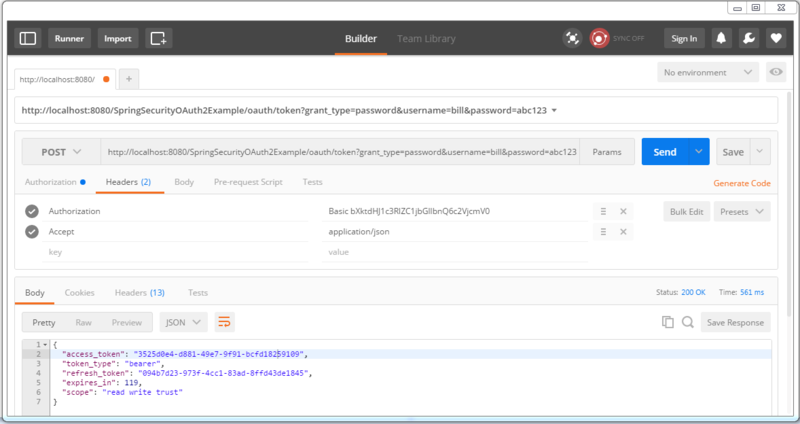 Let’s secure our Spring REST API using OAuth2 this time, a simple guide showing what is required to secure a REST API using Spring OAuth2. Our use-case fits well with Resource-owner Password Grant flow of OAUth2 specification. 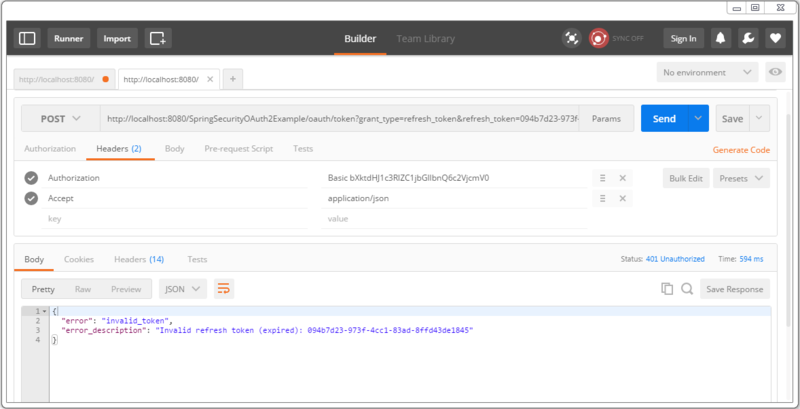 We will use two different clients [Postman and a Spring RestTemplate based java application] to access our OAuth2 protected REST resources. If you are already familiar with OAuth2 concepts, you may want to skip the theory, and jump right into code. As always, complete code can be found in attachment at the end of this article. Let’s get going. Big players like Google, Facebook and others are already using their own OAuth2 implementations for quite some time. Enterprises too are moving fast towards OAuth2 adoption. I found OAuth2 specification rather simple to follow. Yet if you want to start even quickly, an excellent article on OAuth2 fundamentals can be found here which gives a deep insight in OAUth2 theoretical concepts. Spring Security OAuth project provides all the necessary API we might need in order to develop an OAuth2 compliant implementation using Spring. Official Spring security oauth project provides a comprehensive example for implementing OAuth2. The code samples of this post is inspired by that examples itself. The intention of this post is to just use bare-minimum functionality required in order to secure our REST API, nothing more. Could be you. An entity capable of granting access to a protected resource. When the resource owner is a person, it is referred to as an end-user. 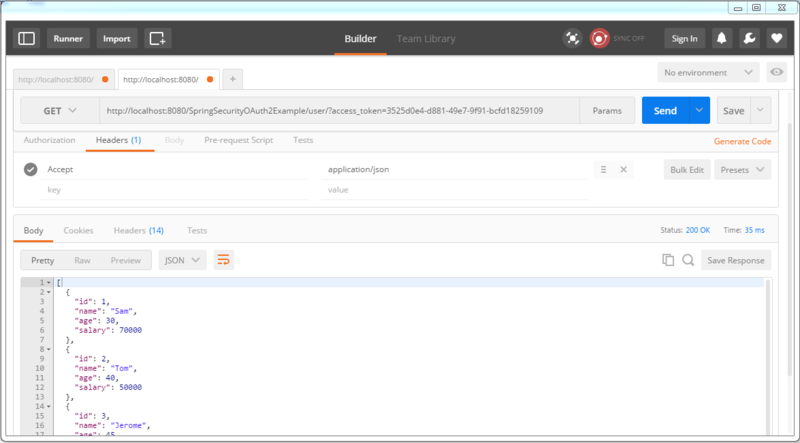 An application making protected resource requests on behalf of the resource owner and with its authorization. It could be a mobile app asking your permission to access your Facebook feeds, a REST client trying to access REST API, a web site [Stackoverflow e.g.] providing an alternative login option using Facebook account. We will be using resource owner password credentials grant type. The reason is simple, we are not implementing a view which redirects us to a login page. Only the usage where a client [Postman or RestTemplate based Java client e.g.] have the Resource owner’s credentials and they provide those credential [along with client credentials] to authorization server in order to eventually receive the access-token[and optionally refresh token], and then use that token to actually access the resources. A common example is the GMail app [a client] on your smartphone which takes your credentials and use them to connect to GMail servers. It also shows that ‘Password Credentials Grant’ is best suited when both the client and the servers are from same company as the trust is there, you don’t want to provide your credentials to a third party. Tokens are implementation specific random strings, generated by the authorization server and are issued when the client requests them. Refresh Token : Mainly used to get a new access token, not sent with each request, usually lives longer than access token. Client can ask for the resource with specific access rights using scope [want to access feeds & photos of this users facebook account], and authorization server in turn return scope showing what access rights were actually granted to the client [Resource owner only allowed feeds access, no photos e.g.]. Let’s implement the necessary building blocks to implement OAuth using Spring Security, in order to access our REST resources. Resource Server hosts the resources [our REST API] the client is interested in. Resources are located on /user/. @EnableResourceServer annotation, applied on OAuth2 Resource Servers, enables a Spring Security filter that authenticates requests using an incoming OAuth2 token. Class ResourceServerConfigurerAdapter implements ResourceServerConfigurer providing methods to adjust the access rules and paths that are protected by OAuth2 security. Authorization server is the one responsible for verifying credentials and if credentials are OK, providing the tokens[refresh-token as well as access-token]. It also contains information about registered clients and possible access scopes and grant types. The token store is used to store the token. We will be using an in-memory token store. @EnableAuthorizationServer enables an Authorization Server (i.e. 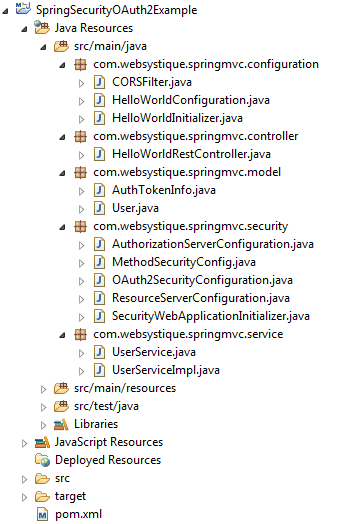 an AuthorizationEndpoint and a TokenEndpoint) in the current application context. Class AuthorizationServerConfigurerAdapter implements AuthorizationServerConfigurer which provides all the necessary methods to configure an Authorization server. .accessTokenValiditySeconds(120).//Access token is only valid for 2 minutes. refreshTokenValiditySeconds(600);//Refresh token is only valid for 10 minutes. Registers a client with client-id ‘my-trusted-client’ and password ‘secret’ and roles & scope he is allowed for. Gluing everything together. Endpoint /oauth/token is used to request a token [access or refresh]. Resource owners [bill,bob] are configured here itself. Additionally, enable Global method security which will activate @PreFilter, @PostFilter, @PreAuthorize @PostAuthorize annotations if we want to use them. Attempt to access resources [REST API] without any authorization [will fail of-course]. Ask for tokens[access+refresh] using HTTP POST on /oauth/token, with grant_type=password,and resource owners credentials as req-params. Additionally, send client credentials in Authorization header. Ask for a new access token via valid refresh-token, using HTTP POST on /oauth/token, with grant_type=refresh_token,and sending actual refresh token. Additionally, send client credentials in Authorization header. 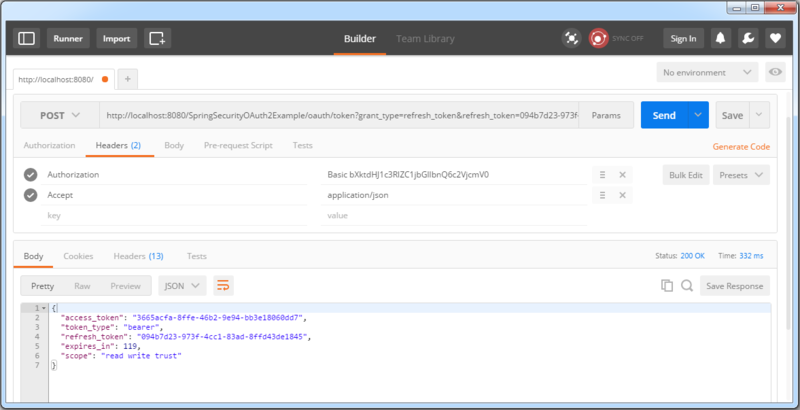 Access the resource by providing an access token using access_token query param with request. The simple Spring REST API i used in most of my posts. Run it and test it using two different clients. Try to access a resource without any auth info, wil get a 401. Let’s get the tokens. First add an authorization header with client credentials [my-trusted-client/secret]. Click on update request, verify the header in header-tab. Send the Post request, you should receive the response containing access-token as well as refresh-token. Save these tokens somewhere, you will need them. Now you can use this access-token [valid for 2 minutes] to access resources. After 2 minutes, access-token gets expired, your further resource requests will fail. We need a new access-token. Fire a post to with refresh-token to get a brand-new access-token. Use this new access-token to access the resources. Refresh-token expires too[10 minutes]. After that, you should see your refresh request getting failed. It means you need to request a new refresh+access-token, as in step 2. Method sendTokenRequest is used to actually get the tokens. The access-token we got in response is then used with each request. If required, You can implement the refresh-token flow easily in below example. * Add HTTP Authorization header, using Basic-Authentication to send client-credentials. * Send a POST request [on /oauth/token] to get an access-token, which will then be send with each request.